The cherished tradition of crafting Kilim rugs is fading. While there are a few organizations in Bosnia and Serbia that are trying to preserve this old-world tradition, people are rarely decorating their modern homes with these rugs anymore. The "Chilim by Mirko Di Matteo" furniture line offers a new and exciting way of including these artifacts in our homes. The design is refined to suit modern tastes and the pieces will be an interesting statement in every interior. 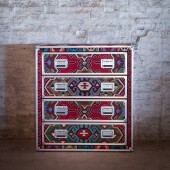 "Chilim by Mirko Di Matteo" is a furniture line created with repurposed 80 years old vintage rugs from Bosnia. These original furniture pieces are unique (each piece is different), environmentally friendly (made with recycled rugs) and socially responsible (preservation of the old weavers' tradition). 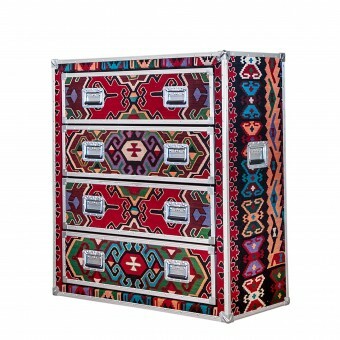 Combining the rugs with "flight case metal hardware" (as framings) we have created indestructible pieces that will preserve the otherwise lost vintage rugs virtually forever as functional display items in our homes. The dimensions of this design are inspired by the over-sized old fashioned chests of drawers in which our grandmothers kept linens. Drawers are tall and deep but unlike the old ones that were always hard to open, these drawers incorporate modern technology such as the soft-close drawer slide mechanisms which make them easily accessible and user-friendly. Even a full-loaded drawer can be opened with virtually one finger. The project started in October 2011 in Croatia and will be presented for the first time on the 2013 "A'Design Award". The core structure is made of 100% pine wood. The rug segments are first glued onto the wooden parts and then additionally sealed by thermal press. The last stage of production is the application of the flight case hardware framing and final assembly. The drawers incorporate soft-close drawer slide mechanism. 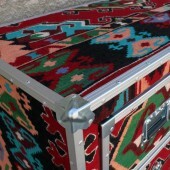 Vintage Kilim rugs are found in rural areas of Bosnia and Serbia. They are also available in certain flea markets. The challenge of this project was to secure the supply for higher - volume production levels. 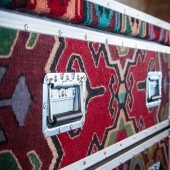 Hence, as an alternative to original vintage rugs, we source hand-made Kilim rugs from several non-profit organizations from the region that cultivate the manufacturing of these rugs based on old-world techniques. They hire skilled women of these post-war countries that are mostly widows and sole bread-winners for their families. For most of these women the handcrafting of the rugs is the only source of income and social integration. This project will also help them and their families to be self sustainable while preserving the tradition and their history. Original design ideas in all areas of everyday life. Chilim Chest of Drawer by Matteo Mirko Cetinski is a Nominee in Furniture, Decorative Items and Homeware Design Category. Chilim Chest of Drawer by Matteo Mirko Cetinski is Winner in Furniture, Decorative Items and Homeware Design Category, 2012 - 2013. 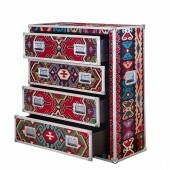 Did you like Chilim Chest of Drawer? Help us create a global awareness for good furniture design worldwide. Show your support for Matteo Mirko Cetinski, the creator of great furniture design by gifting them a nomination ticket so that we could promote more of their great furniture designs.